Django is a high-level Python Web framework that encourages rapid development and clean, pragmatic design. 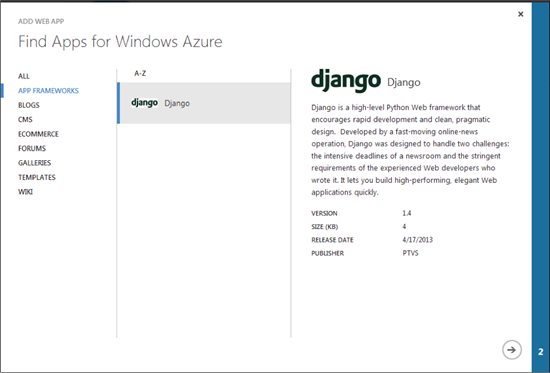 Django is now available in the Windows Azure Web Application Gallery. 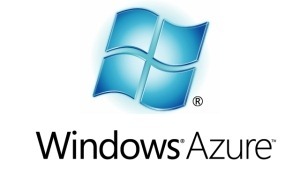 My colleague Bruce Kyle has put together a view into how you can secure your application in Windows Azure. He’s pulled together information from hundreds of pages to provide you with a how-to guide on developing your application in a secure way on Windows Azure. This six-part series describes the threats, how you can respond, what processes you can put into place for the lifecycle of your application, and prescribes a way for you to implement best practices around the requirements of your application. I’ll also show ways for you to incorporate user identity and some of services Azure provides that will enable your users to access your cloud applications in new says. At first, the steps may seem lengthy. But as you will find, Windows Azure shares the responsibility to help secure your application. By using Windows Azure platform, you are able to take a deeper look into your application and take steps to make your application more secure. Part 2: What Azure Provides Out-of-the-Box.This is an overview that security with Windows Azure is a shared responsibility, and Windows Azure provides your application with important security features. But then again, it also exposes other vulnerabilities that you should consider. In addition, I’ll explore how Microsoft approaches compliance. What an exiting release it is! The December release of Windows Azure brings many cool new features including extensive support of open source libraries like Node.js, MongoDB, Hadoop, Solr, Memcached. You can find an overview of the support was announced on Port 25 on Openness Update for Windows Azure. We understand that there are many different technologies that developers may want to use to build applications in the cloud. Developers want to use the tools that best fit their experience, skills, and application requirements, and our goal is to enable that choice. In keeping with that goal, we are extremely happy to be delivering new and improved experiences for Node.js, MongoDB, Hadoop, Solr and Memcached on Windows Azure. We are releasing the Windows Azure SDK for Node.js as open source, available immediately on Github. These libraries are the perfect complement to our recently announced contributions to Node.js and provide a better Node.js experience on Windows Azure. Head to the Windows Azure Developer Center for documentation, tutorial, samples and how-to guides to get you started with Node.js on Windows Azure. We will also be delivering the Node package manager for Windows (npm) code to allow use of npm on Windows for simpler and faster Node.js configuration and development. Windows developers can now use NPM to install Node modules and take advantage of its automated handling of module dependencies and other details. For all of you NoSQL fans, we have been working closely with 10Gen and theMongoDB community in the past few months, and if you were at at MongoSV last week you have already seen MongoDB running on Windows Azure. Head out to the10Gen website to find downloads, documentation and other document-oriented goodies. If you’re using the popular combination of Node.js and MongoDB, a simple straightforward install process will get you started on Windows Azure. Learn morehere. For Java developers, take a look at the updated Java support, including a new and revamped Eclipse plugin. The new features are too many to list for this post, but you can count on a much better experience thanks to new and exciting functionality such as support for sticky sessions and configuration of remote Java debugging. Head over to the Windows Azure Developer Center to learn more. Does your application need advanced search capabilities? If so, the chances are you either use or are evaluating Solr, and so the good news for you is that we just released a set of code tools and configuration guidelines to get the most out of Solr running on Windows Azure. Earlier yesterday, Microsoft announced a number of updates and improvements to Windows Azure that will help developers to more easily access Windows Azure and unlock the value of cloud computing as a development platform. Additionally, today, senior Microsoft leaders will participate in a broadcast event: Learn Windows Azure to demonstrate how easy it is for developers to get started with Windows Azure and show how to build scalable cloud applications using Visual Studio. The event includes a number of great hands-on demos as well. New and Enhanced Open Source Software Experience-Windows Azure SDK for Node.JS makes Windows Azure a first-class environment for Node.JS developers that support hosting, storage, and service bus. Increased SQL Azure maximum database sizes in SQL Azure (at no additional cost) and a new sharding pattern to simplifies elastic scale-out. WHY DOES THIS RELEASE MATTER TO YOU? About one year ago, I was working with an ISV who wanted to migrate their commercial application to Windows Azure but was concerned that SQL Server database schema they relied on was not available in SQL Azure at the time. With new SQL Azure sharding patterns, this partner’s concerns are being satisfied. I’ll look forward to following with that partner and talking and showing off our new capabilities.